Despite the starry night, this morning everything is eerie and mist-shrouded. We’re not going to get the awesome view of Jefferson across the lake until the sun has had a chance to burn this stuff off, and we’re not going to wait around for that. We eat a package of some Paleo coconut-something or other breakfast we bought in the store — if you see it, don’t bother, quick cooking steelcut oats with dried cranberries is much better and cheaper. We pack up as quietly as we can. I love my Thermarest Neoair Xlite, but they are so crunchy when you toss and turn on them in the night, and deflating them is also a loud business. Everyone else is still sleeping. As we shoulder our packs and start out, a few are starting to emerge. Today we’re not sure how far we want to hike. We have reservations at Timberline Lodge for the 12th, Friday night. The current plan is to do two low mileage days (20 miles) and then a short day into Timberline. There’s a river with some tent sites 19 miles from here. Of course Marc thinks we should go farther. We decide to just hike the to the water and then figure it out. Unlike yesterday, today the trail is easy and smooth, pretty flat. We sail along, not even stopping to rest for a couple of hours. After a while the sun melts off the mist. Back to blue! 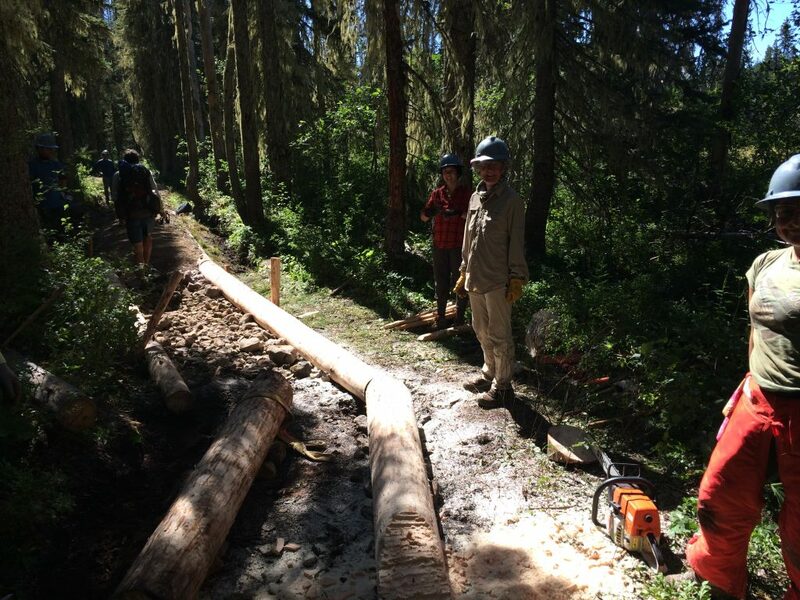 We encounter a trail crew, and spend quite a while chatting with them and thanking them for all their hard work. It’s dedicated volunteers like these that make hikes like this even possible! One older guy said they were “working on the turnpike” and that’s an apt description — a super fancy smooth elevated bit of trail, bordered by huge logs. It seems kind of extreme to me — the trail isn’t that bad here, and there are still so many blowdowns to clear elsewhere… But maybe in wetter weather this is a mud slog. Who knows? Coming down off Pinhead saddle, I develop a sore spot on my left big toe and stop to check it out. Sure enough, there’s a blister starting on the underside of my toe. I wrap some duct tape around it, which is awkward because it’s a toe. I had swapped out my Injinji toe socks with a new pair in Sisters, this time made with some sort of coolmax fabric. I also swapped out my shoes with a new pair in Bend, and these are a half size bigger. (I was feeling like my toes were slightly crammed in the old pair.) We also got gaiters in Bend, to prevent detritus from getting inside the shoe and tearing up fabric on the achilles region. I’m having so many more problems with my feet this trip. First the backs of my heels, now my toe. And it seems like at the end of a long day’s hike, the bottoms of my heels are killing me much worse than they did last summer. Now I think these new Injinjis are too slippery inside the shoes. Or maybe the shoes are too big. Sigh. We get to the Warm Springs River at about 3:00. There’s a SOBO hiker and his dog sitting at the creek, and we spend a while chatting with him and soaking our own feet. He’s from Belgium. He shows me the healed remnants of a blister on his heel — It had gone through many layers and still looked kind of dicey. His husky-shepherd mix is carrying saddlebags and has some raw-looking spots under its belly and legs where the pack had been rubbing. I don’t know about taking a dog on this kind of adventure. I get that it’s nice to have the company, but you have to worry about water and food for them, and then their feet. All that lava would be brutal. People put shoes on their dogs’ feet, but still. It’s crazy early! Way too early to camp. We’d just sit around getting bitten by mosquitoes. We decide to cook our dinner here and then keep hiking until we find a spot. There’s a forest service campground at Clackamas Lake, 8 miles away or so. That might work. Or we could dry camp if we find a good spot before then, even though dry camping is such a drag. We do some calculations and realize that if we make it to Clackamus Lake, we could get to Timberline tomorrow. Maybe I could try and change the reservation. We eat our dinner, pack up and head out. We’re hiking on tribal lands now, have been for a large part of the day. You can see places in the close distance where there have been clear cuts. In fact, the more we hike the more it seems to me that the trail itself is a just a corridor between clear cuts. I find this forest kind of creepy. It’s so silent. It’s almost like I can feel the pain from the nearby areas that have been assaulted so violently, and I get the sense that we’re not welcome here. Nonsense, probably. The hiking is easy, but I don’t want to even try and find a spot to camp in this. 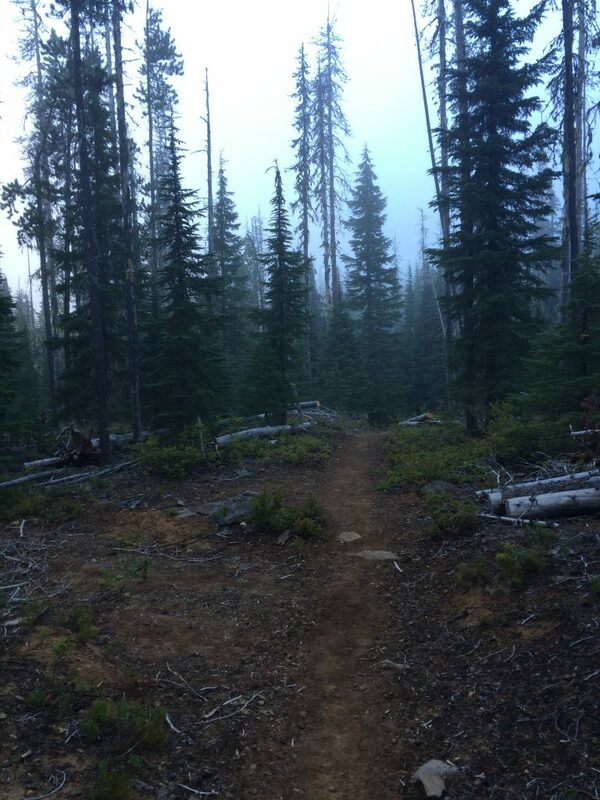 We cross several logging roads, and at one of them, I get a cell signal. I call Timberline Lodge and reach a woman who says there are rooms available tomorrow night, but when I ask if I can switch my reservation from the 12th to the 11th, she tells me to call a different number, the reservations desk. I do, but no one answers, they close at 5:00. I try calling her back, and get someone who can’t hear me. The connection goes from one bubble to two. Obviously not strong enough. I try again, same result. We keep hiking. Then we cross a cut for some power lines, and see a hiker sitting on his pack and talking on his phone. I get a signal and try again. Success! Scotty at Timberline manages to do the switch, we pay only $10 more. We’ve lost some time with all this phone calling and so we quickly head on. The sun is low and the forest is getting dusky. But now we know we have a room tomorrow night! FINALLY we hit the junction at about 7:30, and the half mile down to the car campground feels endless. But then we get there and there’s a huge, empty, lovely site with a picnic table. Clackamas Lake isn’t really a lake, so there’s no swimming to be had, or even water, as far as I can tell. We set up the tent. I take my aching feet out of my shoes and put on my crocs — sweet relief! There’s a pit toilet, and some cars with tents and RVs camped nearby. I limp around a little and hit pay dirt — a water spigot! We don’t have to dry camp after all! Life is good. I will sleep so much better if I’m not covered with a day’s worth of sweat and grime. We worry for about five seconds about paying for our site, but figure if a ranger comes by we will settle with him/her. Neither of us feels like trekking up to the entrance, we’re just too tired. This day ended so well — we’ve got a bed for tomorrow night and a great campsite for tonight. I pop a couple Advil and slide my sore feet into my sleeping quilt. I lie there thinking to myself: This is the farthest I’ve ever hiked in a single day in my entire life! A record-setter! This entry was posted in Hiking, PCT Oregon 2016 and tagged backpacking, hiking, Oregon, Pacific Crest Trail, PCT by gydle. Bookmark the permalink.